The Challenge: Remote Video Response (RVR) had identified that their customers were buying video systems at the “best available price” rather than being loyal to one manufacturer. This presented RVR with a challenge when offering remote video monitoring. How could they consistently support a growing range of different video devices, expand their suite of monitoring services and accomplish this without a major capital outlay? 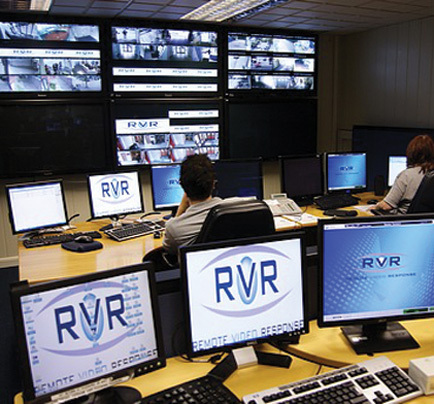 Background: Established in 1998, Gloucestershire-based Remote Video Response (RVR) has grown to become a leader in the UK CCTV Monitoring and Response industry. RVR is a significant part of the SMC group of companies, employing more than 200 people, and with annual sales of more than £23 million, they offer services to customers in all sectors, regardless of size or location. RVR is one of the first UK monitoring stations to be accredited to BS 8418 and the latest EN standards. The Solution: After extensive research looking for a software platform to monitor both current and future systems, Immix was selected as the logical choice to meet the challenges faced by RVR. Immix Central Station (CS) integrates many disparate CCTV systems into one easy to use graphical user interface. Immix is the market leader in remote video monitoring software with an unparalleled integration library. Devices are integrated using a standard methodology; this normalizes response in the monitoring center regardless of the devices in the field. It allows for the quick development of new device integrations as customer demands change.It also centralizes IT resources, reducing the capital outlay to implement a large numbers of technology specific servers that would normally be required to support standalone VMS systems. Results: Investing in Immix has allowed RVR to acquire new business by incorporating mixed technologies that they were not previously capable of monitoring. To date, RVR has used Immix to integrate with more than 15 different security systems and has eliminated the need to purchase and support standalone VMS systems. This consolidation has simplified operator response and training, and allowed RVR to scale their remote monitoring business. Saved the cost and time involved with adding new integrations. During the first few months of operation, four new video integrations were added to monitoring, saving £32K on the cost of custom integration development through their traditional alarm monitoring platform. Reduced the cost of training operators. Operators are trained to use one simplified system. Utilizing the scripting facility to generate standard operating procedures, reduces operator training requirements and improves response times and operator efficiencies. Automated management reporting, eliminating several hours a week in manual report creation. The Immix web interface provided a single point of access to all aspects of running the RVR, allowing site setup and monitoring to be managed simply through a web browser. Using Immix delivered significant advantages for both their installers and site managers with the integration of an innovative Mobile application providing individuals with their own route for receiving critical event information, site data or even viewing live images via their mobile devices, iPhone, iPad or Windows supported devices. WANT TO LEARN MORE ABOUT HOW IMMIX CS COULD WORK IN YOUR ENTERPRISE?